1. To start my readers off on level ground, can you tell them what you mean when you say “new religious movement”? Generally, a new religious movement (abbreviated as “NRM”) is a religion that has formed in the past 50-60 years. That is a moving target, which means that some groups that were NRMs when scholars first coined the term in the 1970s are really stretching the limits of the word “new” by now. The Nation of Islam, for example, is often considered a NRM, but it was founded in 1931! Scholars tend to use the term “new religious movement” where many other people would say “cult.” That’s because cult is a pejorative and subjective term. Who says they belong to a cult? Southern Baptists consider Mormons a cult. (But some people consider Southern Baptists a cult too!) The Hare Krishnas, who I study, are often called a cult here in America, but in India they are seen as a traditional religious denomination. 2. How did you end up focusing on these new religious movements instead of more established religions like Judaism and Christianity? New religions are bellwethers—they are fast-changing and usually led by self-proclaimed prophets or seers who claim to speak directly for the divine. This means that they can respond quickly and straightforwardly to the big issues of the day. Established religions take a longer time to do the same. The vast majority of sociological studies of the past 40 years have shown that the people who join NRMs are normal people. What appeals to them and drives their religious questioning are the same issues that percolate through wider culture. NRMs are the cutting edge, so to speak. 3. What made you decide to examine new religious movements with regards to their relationships with science? I think that science (and its daughter, technology) is one of the most powerful forces in the modern world, along with religion. Everyone today needs to deal with science, whether they want to or not. And when I looked at NRMs, I found that they all talked about science, often making science a central issue in their theologies. More personally, I’ve always been interested in both the study of science and religion. I’ve been a science geek since I was a child, and obviously religion is something I’ve decided to study professionally. For me, it was an obvious choice. 4. What can we learn about religion and science from what you discovered in researching these new religious movements’ thoughts on the subject? I was just teaching a class recently on science and religion, and I started the class by asking the students what came to mind when they heard the phrase “religion and science.” Most of the students said that they thought of controversies and conflicts. But that isn’t the reality on the ground. From my study of new religious movements, what I found was creative tension, not conflict. This creative tension leads to a number of very inventive ways to rectify science and religion in those NRMs. Oftentimes (but not always), creative people and groups have found ways to deal with even sticky issues like evolution or the age of the earth. That’s not to say that there aren’t heated disagreements and conflicts over particular issues. But it’s much more complex than what we might expect from listening to sound bites. 5. The three new religious movements you discussed in your book “Prophets and Protons” were The International Society of Krishna Consciousness, Human Individual Metamorphosis (Total Overcomers Anonymous), and Holy Spirit Association for the Unification of World Christianity; better known by most as Hare Krishnas, Heaven’s Gate, and the Moonies. Many label these organizations as cults, do you find some people become confrontational or offended by your study of these groups? Well, some members of these groups are offended at being in the same category as the other ones! Remember, no one believes that they belong to a cult. I’ve had Hare Krishna members smirk when I say that I am studying the Moonies, and vice versa. But generally most people have understood that these groups are worth studying. I’ve given all sorts of talks on my research, not just at scholarly meetings but at bookstores and churches and such, and I’ve yet to have anyone tell me that they are offended by my work or that they disagree with my basic premise that controversial religions should be taken seriously and studied. If I may make a comparison, it is like studying Creationists. One can study why people believe in Creationism without promoting or endorsing their specific religious positions. In fact, I think that these sort of non-mainstream groups need to be studied. We need to understand what power these ideas have, and why people find them attractive. Simply dismissing the odd or controversial is tantamount to the metaphorical ostrich sticking its head in the sand. 6. I hadn’t realized until reading your book that the Heaven’s Gate website was still up on the internet. Personally, I found it quite unnerving to Google “Heaven’s Gate” and BAM! Here’s essentially a website of suicide notes. Do you find it hard when studying a group that essentially killed itself off (literally and figuratively) to separate the academic research from the emotional response to some of what you learn? Yes, it is difficult. Have you watched the “exit videos”—effectively video suicide notes? (You can find them at http://www.youtube.com/user/1RiverofAngels ) I disagree strongly with the choices they made. But I think it is very important to ask why they made those choices, and to recognize that they were in fact choices. Those suicide notes and videos are so disturbing because the members of Heaven’s Gate really believed in what they were doing, and they come across as rational people. If they were raving lunatics, it would be easier. I never knew any of the original Heaven’s Gate members (though I did interview a former member, Rkkody, before his suicide a few months after the main ones). That being said, I look at my research as my own way to deal with the emotional response of their actions. We need to understand why they did what they did. 7. I was surprised to find that when choosing to study new religious movements and their relationships with science that Scientology didn’t come up. With its founder having been a prominent science fiction author, the groups’ use of things such as E-Meters and a sizeable internet presence, and with the word “science” almost literally in their name, it would seem like a match made in research heaven. How did Scientology not make the cut? They were part of the original research, but they denied me access to their archives. My research is historical, and I need full access to their historical and current materials to do my work right. Scientology is at its heart an esoteric tradition, meaning that you need to be an insider to be allowed full access to the materials. Since I had a wealth of sources on the other groups, and my research on Scientology was so limited, I decided to drop them from the final project. I hope one day they open all their religious sources to scholars. That is what the Hare Krishnas and Unification Church have done. 8. The Magical Buffet are big Flying Spaghetti Monster fans! Is the Church of the Flying Spaghetti Monster and its adherents, the Pastafarians, a new religious movement? Depends on your definition of religion! If you define religion as belief-based, then I am not sure. Do people really—I mean really, really—believe the faith statements promulgated by the Church? Most Pastafarians I’ve met don’t. On the other hand, there are other ways to define religion. Religion can be based on shared values, or community, or self-identification. In those regards, the Church of the Flying Spaghetti Monster is a new religious movement. 9. I greatly enjoyed “Prophets and Protons: New Religious Movements and Science in Late Twentieth Century America”. What’s your next project I can look forward to? I’m working on two projects. One is a longer study of Heaven’s Gate. The group fascinates me, and I am always looking for a new angle to understand it. The new project tries to understand the relationship of Heaven’s Gate to wider currents in American culture, like conspiracy thinking and apocalypticism. In that way—connecting a controversial group to wider culture—it is a lot like the first book, just more focused on this one group. The other project is on science as a religion. There are several groups and people I could look at, and I am still mulling over the options. One possibility is to look at social/scientific movements like environmentalism as a new religion. The other is to look to how working scientists engage and respond to religious ideas. Regardless of which direction I take with the research, I will continue to study the nexus of science and religion. How did you decide on the name “Magical Buffet”? Ah, that’s right, you weren’t around here for the original Magical Buffet. Initially The Magical Buffet was a monthly online e-zine that focused entirely on religion and spirituality. I became inspired while watching the movie “Big Trouble in Little China” for probably the hundredth time, if not more. A character in the movie, Egg Shen, says, “Of course the Chinese mix everything up, look at what we have to work with. There’s Buddhism, Confucianism, and Taoist alchemy and sorcery. We take what we want and leave the rest…. Just like your salad bar.” That had me realize a lot could be gained by offering up articles introducing readers to as many different ideas as possible, enabling them to “Take What They Want, and Leave the Rest”. However, I had other interests; music, food, politics, and I realized that those were also communities and that I would have even more fun and potentially more could be gained by my introducing all these different communities, spiritual and otherwise, to each other so The Magical Buffet still seems like an appropriate name for the site. And let’s face it, it’s a cool name. 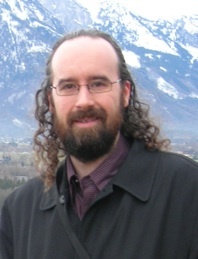 About Benjamin E. Zeller: Benjamin E. Zeller researches religion in America, focusing on religious currents that are new or alternative, including new religions, the religious engagement with science, and the quasi-religious relationship people have with food. 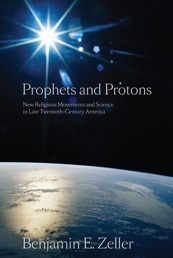 His book, “Prophets and Protons: New Religious Movements and Science in Late Twentieth-Century America” (NYU Press, 2010) considers how three new religious movements engaged science and what they reveal of broader culture. He holds a Ph.D. from the University of North Carolina, and a Masters of Theological Studies from Harvard University. Zeller serves as Assistant Professor of Religious Studies, Coordinator of the Religion and Philosophy Major, and Director of the Honors Program at Brevard College, a private liberal arts college in North Carolina’s Appalachian mountains.